"Both individuals and governments can lead this change." The challenge of moving the world toward a low-carbon future in time to avoid exacerbating global warming and to create energy self-sufficient countries is one of the greatest of our time. The roadmaps developed by Jacobson’s group provide one possible endpoint. For each of the 139 nations, they assess the raw renewable energy resources available to each country, the number of wind, water, and solar energy generators needed to be 80% renewable by 2030 and 100% by 2050, how much land and rooftop area these power sources would require (only around 1% of total available, with most of this open space between wind turbines that can be used for multiple purposes), and how this approach would reduce energy demand and cost compared with a business-as-usual scenario. The analyses specifically examined each country’s electricity, transportation, heating/cooling, industrial, and agriculture/forestry/fishing sectors. Of the 139 countries—selected because they were countries for which data were publically available from the International Energy Agency and collectively emit over 99% of all carbon dioxide worldwide—the places the study showed that had a greater share of land per population (e.g., the United States, China, the European Union) are projected to have the easiest time making the transition to 100% wind, water, and solar. Another learning was that the most difficult places to transition may be highly populated, very small countries surrounded by lots of ocean, such as Singapore, which may require an investment in offshore solar to convert fully. As a result of a transition, the roadmaps predict a number of collateral benefits. For example, by eliminating oil, gas, and uranium use, the energy associated with mining, transporting and refining these fuels is also eliminated, reducing international power demand by around 13%. Because electricity is more efficient than burning fossil fuels, demand should go down another 23%. The changes in infrastructure would also mean that countries wouldn’t need to depend on one another for fossil fuels, reducing the frequency of international conflict over energy. Finally, communities currently living in energy deserts would have access to abundant clean, renewable power. 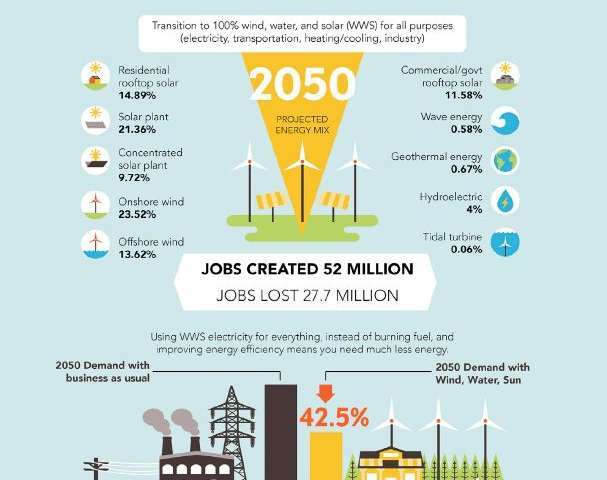 The 100% clean, renewable energy goal has been criticized by some for focusing only on wind, water, and solar energy and excluding nuclear power, “clean coal,” and biofuels. However, the researchers intentionally exclude nuclear power because of its 10-19 years between planning and operation, its high cost, and the acknowledged meltdown, weapons proliferation, and waste risks. “Clean coal” and biofuels are neglected because they both cause heavy air pollution, which Jacobson and coworkers are trying to eliminate, and emit over 50 times more carbon per unit of energy than wind, water, or solar power. The 100% wind, water, solar studies have also been questioned for depending on some technologies such as underground heat storage in rocks, which exists only in a few places, and the proposed use of electric and hydrogen fuel cell aircraft, which exist only in small planes at this time. Jacobson counters that underground heat storage is not required but certainly a viable option since it is similar to district heating, which provides 60% of Denmark’s heat. He also says that space shuttles and rockets have been propelled with hydrogen, and aircraft companies are now investing in electric airplanes. Wind, water, and solar can also face daily and seasonal fluctuation, making it possible that they could miss large demands for energy, but the new study refers to a new paper that suggests these stability concerns can be addressed in several ways. This article was provided by Cell Press. Materials may have been edited for clarity and brevity.